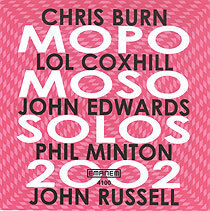 Chris Burn, piano, percussion (tracks 7, 8); Lol Coxhill, soprano saxophone (tracks 6, 8); John Edwards, double bass (tracks 4, 8); Phil Minton, voice (tracks 2, 3, 5, 8); John Russell, guitar (tracks 1, 5, 8). Recorded at Mopomoso @ the Red Rose, London on 17 November 2002. Cover design (reproduced above) by Martin Davidson.